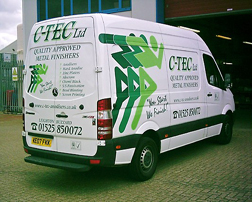 C-Tec Ltd. specializes in offering metal finishing services. We provide sulphuric anodise, zinc plating, and screen printing. Anodic oxidation is very widely used for the treatment of aluminum and aluminum alloys. Anodising provides an attractive decorative and protective finish for a wide variety of aluminum components. In the anodising process, a thin invisible film of aluminum oxide forms naturally on the surface and provides some degree of corrosion protection for the underlying aluminum. Depending upon the initial surface condition and alloy composition, a semi-bright, or matt effect will be obtained. This is known as clear or natural anodising.